Max Factor is a women’s cosmetic line offering a variety of products for lips, face, eyes, and nails. It is one of the most revered names in the cosmetic industry, since its establishment in 1909 by Maksymilian Faktorowicz, a Polish Jewish cosmetician in Los Angeles, California. The original products Max Factor developed were for the movie industry, where actresses (and actors) needed to apply greasepaint to hide imperfections and the sweat from the glaring lights. Max would personally apply his lighter versions of greasepaint to the likes of Jean Harlow, Judy Garland and Rudolph Valentino, personally blending shades to match their skin tones and characters. In 1925, in fact, his company was asked to supply 600 gallons of “light olive” makeup for the movie Ben Hur in order to make all the actors look the same. His sons even convinced Max to market his products as “make up” rather than greasepaint, to attract more non-movie customers. The family owned company also supplied camouflage products to the troops during WWII. 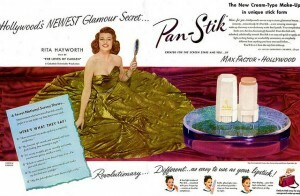 As the movie industry progressed, so did the Max Factor line of products, offering translucent powders for TV’s harsh lighting and Technicolor’s more realistic demands. By the 1960s, the company’s line included perfumes, mascaras, and other cosmetic products for the general public; these products were sold exclusively in department stores by uniformed Max Factor sales associates. The max Factor Halston line of perfumes, in the ‘70s, was second only to Chanel #5. The family owned and operated company eventually was eventually bought in 1983 by Esmark (a partner with Beatrice Foods), which added it to their Playtex division and moved the headquarters from Los Angeles to Stamford, Connecticut. In 1986, Revlon bought the Playtex division for $500 million and in 1991; Procter and Gamble acquired the Max Factor line for $1.5 billion. Currently, the various Max Factor products are available in select grocery stores (such as Super Targets) and drugstores (such as Walgreens) in the US, and internationally in several countries. The mascaras and eye treatments are especially popular, as well as the nail polishes and lacquers.